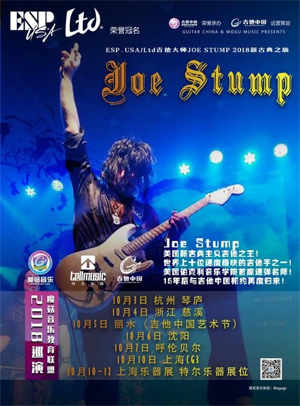 American shred guitar legend JOE STUMP has announced a tour of China during the month of October. "I traveled to China for the 1st time back in 2003 for a run a shows and guitar clinics in Asia and am looking forward to going back. It will be a grueling couple weeks but there's a ton of great guitar fans over there, so it'll be great to play for them." To those in guitar and metal circles Joe Stump should need no introduction. The Shredlord has been raining down full throttle neoclassical shred/speed metal since Guitar Dominance was released over 20 years ago. He is one of the most intense and over the top guitarists on the planet and his maniacal guitar driven releases are amazing displays of power and jaw dropping technical command. He was named by Guitar One magazine as one of the top 10 fastest shredders of all time, by Guitar World as one of the 50 fastest players of all time and by Guitarist magazine as one of the top 20 shredders of all time. He has appeared in countless guitar and metal based publications, fanzines and webzines worldwide. Joe Stump has toured the world both as a solo artist and with metal bands JOE STUMP'S REIGN OF TERROR, HOLYHELL, RAVENLORD, EXORCISM and TOWER OF BABEL. Joe's also an Associate Professor at the esteemed Berklee College of Music where he has been the metal/shred guitar specialist for the last 22 years. For the latest Joe Stump news and show dates, visit his official Facebook page.